Devon Hill Associates harnesses the research power of mystery shopping to analyze and improve the patient experience in hospitals and healthcare organizations — and the marketing and sales effectiveness of senior living and long-term care organizations. Medical mystery shopping is a research tool for observing, assessing and analyzing the patient experience through the eyes of incognito patients and visitors. Trained mystery shoppers, posing as real patients, offer healthcare providers valuable insight into the efficiency and responsiveness of their operations, as well as their perceptions about the care being provided. Oftentimes, the reality of care vs. a patient’s perception of that care can differ in both positive and negative ways. By reporting on these differences — evaluating them carefully — and responding to them — it’s possible to improve patient satisfaction, enhance the patient experience and boost an organization’s HCAHPS scores. Senior living and long-term care mystery shopping assess and analyze the sales experience of prospective customers looking for housing and/or care options for themselves or their family members. Mystery shoppers provide property owners with specific feedback about how effectively phone calls, personal visits and follow-up activities are handled. A well-designed mystery shopping program can uncover sales and marketing problems, and ultimately improve occupancy. For more than 20 years, Devon Hill Associates has employed mystery shopping to identify barriers that stand in the way of patient satisfaction and senior living marketing success. Some of our satisfied clients can be seen here. Over the years, we’ve accumulated an extensive knowledge of best practices and industry standards that enables us to put our findings into a broad context for our clients, as well as provide a baseline to benchmark and monitor continued progress. Our medical mystery shopping clients include hospitals, health centers, clinics, rehabilitation facilities, audiology offices and even health-affiliated facilities such as hospital-sponsored fitness centers. Our senior living and long-term care clients include small and large independent and assisted living communities, as well as nursing homes. Devon Hill’s unique Secret Patient service has been featured in The New York Times, Wall Street Journal, San Francisco Chronicle, Pittsburgh Post-Gazette and Los Angeles Times, as well as numerous other newspapers, Trustee magazine, California Medicine, Healthcare Forum Journal, Group Practice Journal — and other national and industry publications. 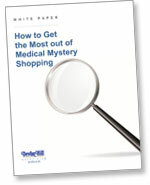 To request our white paper, “How to Get the Most out of Medical Mystery Shopping,” click here. Want more information about our mystery shopping services? Feel free to contact us. brings clarity and understanding to how healthcare providers are truly perceived by patients in critical performance areas. provides unbiased feedback about how patients perceive access, prices, quality, communication, service and safety. Scam Alert! Devon Hill Associates is not associated with SPECFINDHOLDS, does not review staff performance for Walmart and does not send out Gmail, Yahoo, etc., solicitations for mystery shoppers.